When I blogged about passing parameters to TOP, we ran into a problem that has many possible solutions. Perhaps the least complex answer was just to fix the index. Nine times outta ten, that’s what I’d do. Since I offered some other possible solutions, I do wanna talk about the pros and cons of them. In this post, I’ll talk about using slightly less than fully parameterized dynamic SQL, which will, of course, terrify even people who live in Baltimore. While I’m not smart enough to figure out a SQL injection method without altering the stored procedure, that doesn’t mean it can’t happen. If we fully parameterize this, we’ll end up with the same problem we had before with plan reuse. Since we don’t, we can can use a trick that works on filtered indexes. Every different top will get a new plan. The upside is that plans with the same top may get reused, so it’s got a little something over recompile there. And of course, their own plan cache entry. If lots of people look for lots of different TOPs (which you could cut down on by limiting the values your app will take, like via a dropdown), you can end up with a lot of plans kicking around. Likely not, because of the potential risk, and the potential impact on the plan cache, but I thought it was interesting enough to follow up on. 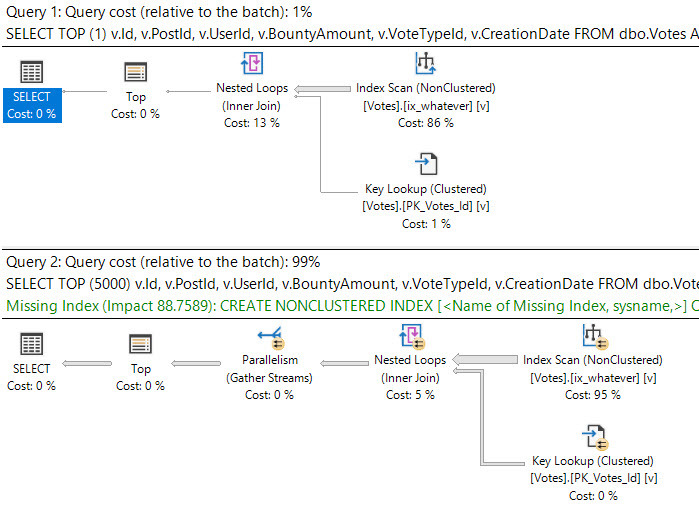 Why not parameterize @top for sp_executesql? That will avoid multiple plans. Stan — make sure you read the post. I want different plans because not all values for TOP should share the same plan.